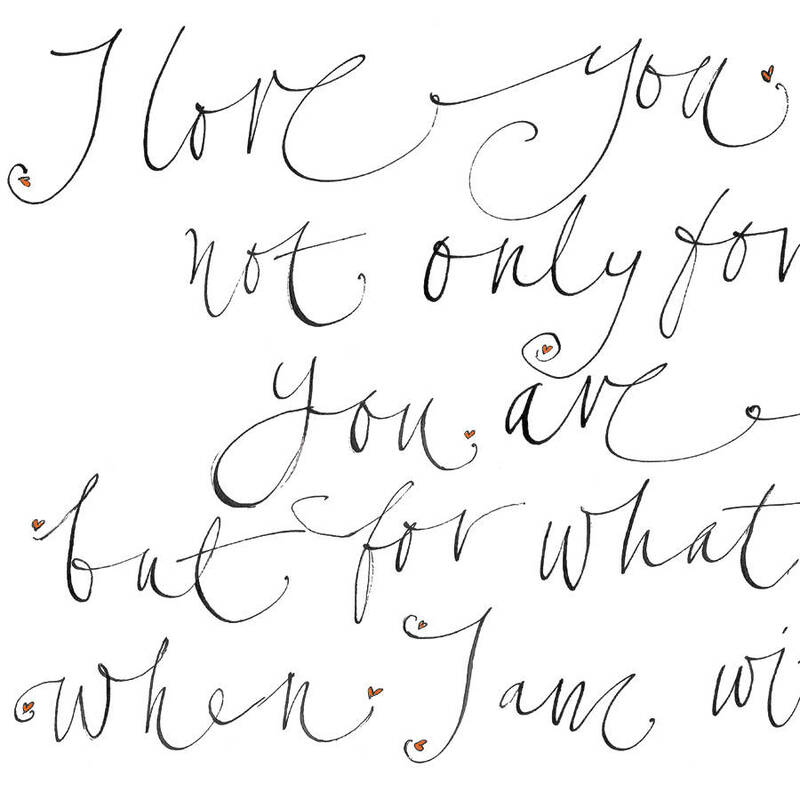 'I love you not only for what you are, but for what I am when I am with you', beautiful words celebrating true love. 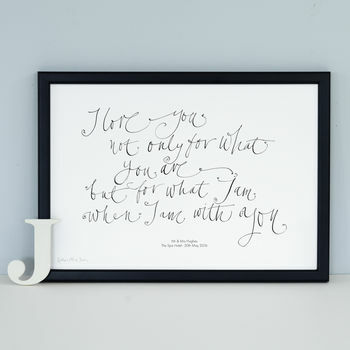 With a feeling of old-world romance, this personalised romantic art print taken from the poem ‘Love’ by Roy Croft, makes the perfect gift to celebrate a unique love story. The first anniversary gift is paper, so this would make an original gift which will be cherished for years to come. The delicate calligraphy was originally drawn by hand with a traditional dip pen and Indian ink. Tiny, hand painted hearts in your choice of watercolour that are woven into the script, add a subtle hint of colour. The calligraphy style is deliberately light and flowing to create a more romantic feel to the artwork. 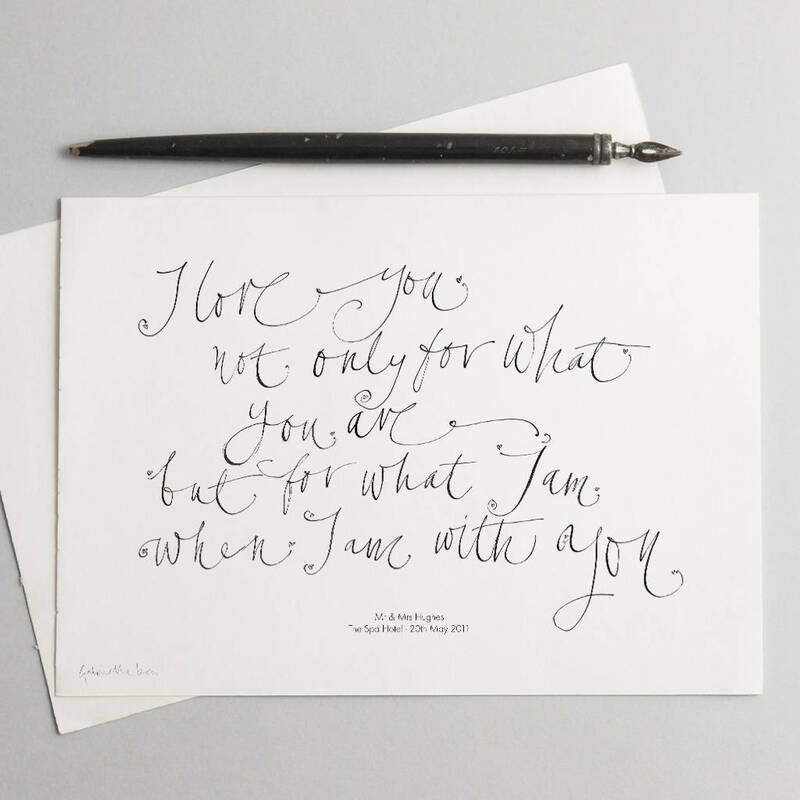 Add your chosen names, dates, locations or a short message typeset in a simple font under the calligraphy to make a thoughtful personalised gift. This Personalised Romantic Quote 'I Love You' Print would make a thoughtful wedding gift, engagement gift or anniversary gift. It would also make a lovely Christmas gift, Valentine's Day gift or a special birthday gift. This personalised art print is perfect for sister, brother, son, daughter, cousin, friends, best friends, girl friends, boy friends, wife, husband, mum, mummy, auntie, uncle, dad, daddy, mother in law, father in law, step mum, step dad. The artwork is printed, personalised and hand finished just for you. A low-res black and white visual will be sent to you via your order enquiry for approval. The details will be copied from your order. Please have a look at the 3rd image to see the detail of the calligraphy. Please allow up to 3 working days for your artwork to be prepared and delivered. Pease note; this print is sold unframed and is sent free via Royal Mail Signed For service. It is sold unframed and comes in a cello bag with a backing board and sent flat in a solid card envelope with an outer waterproof bag. The print is landscape A4, W29.7 x D21 cm and will fit any A4 frames.